What Does Basement Waterproofing Cost? A wet basement is a homeowner’s worst nightmare. Whether it’s a finished basement that has been transformed into a bonus room for entertainment or if it’s just being used as a storage room, a wet or leaky basement can seriously damage a home, contribute to hazardous conditions and financially burden the homeowner. A home is not meant to be damp or wet and there are certain states and cities that are more prone to leaks and floods than others. If you have experienced leaking walls, floors or cracks in your basement then you most likely need the assistance of an experienced basement waterproofing company. Even if you’re lucky enough to have a warm and dry basement then you should probably also consider discussing basement waterproofing with a professional contractor . It’s always better to prevent a problem before it occurs. Investing in basement waterproofing will require a financial input, but the cost of preventive waterproofing is much lower than that of drying out a leaky basement, sanitizing it, finding the problem, patching the leak and then installing preventive measures. Basement waterproofing can cost as little as $20 for small wall cracks and as much as tens of thousands of dollars for repairs and complete basement waterproofing systems. There are different methods of basement waterproofing to choose from and different solutions are used for different homes. What may work in one home does not mean it will necessarily work in yours. Triad Basement Waterproofing works to locate the source of a problem and fix the cause so that the problem does not repeat itself. So what does basement waterproofing cost? 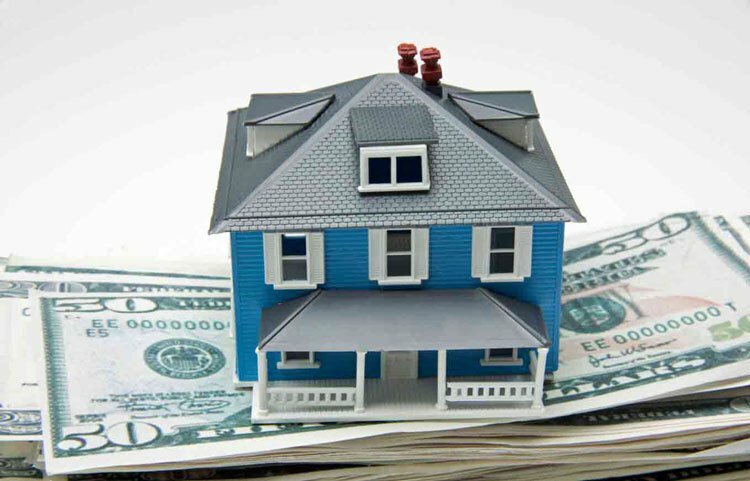 Let’s take a look at the different factors involved in the cost and what the cost involves. The first thing to keep in mind when considering basement waterproofing services is your motivation behind needing or wanting the services. Are you looking for preventive measures or do you already have a problem that needs fixing? If you have clogged or misdirected gutters and downspouts then replacing or redirecting a gutter can cost anywhere from absolutely nothing to clean out debris and redirect it, all the way up to $300 for complete replacement. If you have a condensation issue then the main problem is probably the result of poor ventilation. If there is no heating or air conditioning in the basement, then installing a dehumidifier is a simple fix that costs around $250. If it is your water pipes that require insulation then that can cost anywhere between $50 and $100. Once you figure out what the problem is or your main motivation behind investing in basement waterproofing you will be able to make better decisions about the services you need and what you can pay for. 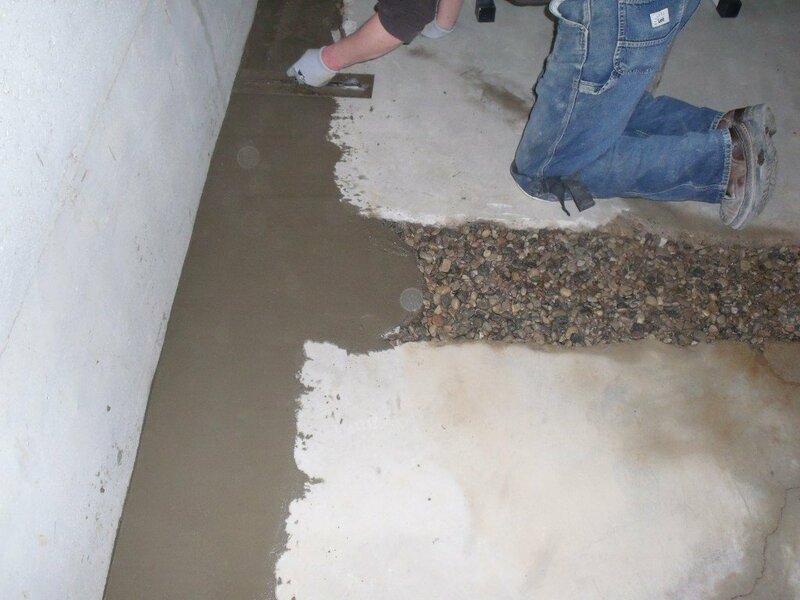 There are different methods of basement waterproofing for you to choose from. The most common forms of waterproofing includes interior sealants , exterior systems and drainage . Basic interior waterproofing is made up of waterproof coatings, silicate-based concrete sealers and various acrylic formulas. Concrete waterproofing consists of thick cement-like coating , which quickly adheres to masonry walls. Concrete waterproof coatings cost between $30 and $40 for 100 square feet. Silicate-based concrete sealers are only suitable for walls that have not been painted or sealed and they react with concrete or brick in order to create a hard waterproof surface. Applying these sealers can cost anywhere between $40 and $50 for 200 square feet. Before any of these waterproof coatings and sealants are applied it is important to fix and repair any cracks that may be present in the walls, floors or on the ceiling. Special sealants can be injected into the opening to penetrate through to the exterior where they will seal off the path to potential moisture and leaks. While these sealants and waterproof coatings are meant to last a long time and they come with warranties they are not permanent solutions to big problems such as strong hydrostatic pressure that pushes against the foundation of the home. Another way to waterproof your home is to use plastic sheets and panels in combination with an interior drainage system. They won’t exactly stop water from getting in through the wall, but they will prevent it from ruining the inside of your basement and your belongings. The water that does make its way in through the walls will run down the plastic into a drainage system in the floor and a sump pump will easily move the water out of your basement. The entire system can cost between $3,000 and $5,000 for a 20-by-20 foot basement room. The best option for waterproofing is investing in a full-scale exterior waterproofing solution. This is also the most expensive, often costing between $15,000 and $30,000. Exterior waterproofing involves excavating around the house and installing waterproof coatings and drainage panels so water and hydrostatic pressure can’t get to the foundation of your home and inside your basement and property. When deciding on a basement waterproofing system for your home it is important to pick a problem-solving solution that will tackle moisture and leaks head on and prevent them from reoccurring. While this solution may sometimes cost more than just a quick patch-up, it should be viewed as a long-term investment. It’s better to spend more money for a permanent fix rather than waste money on temporary repairs that won’t hold long. Remember that one solution that is highly advertised and works for others may not necessarily fix your problem or work for your home, as each situation is unique. Be open-minded and consult with various contractors. Companies should offer a solution specifically tailored to your home that tackles your moisture issues at the source of the leak. Surely you are looking for the best basement waterproofing services for your home. Picking a contractor to work with is an entire process on its own and it’s important to feel at ease with the company you ultimately hire. Hiring a contractor to perform any kind of waterproofing is a significant investment that can cost you as little as $300 for simple repairs and as high as $2,000 or $20,000 for more complex systems and solutions. It is also very important to get several estimates from various companies so that you can find the best price for the service you need. Make sure you know what to look for in a basement waterproofing company and how to differentiate between the companies who try too hard to sell you services you don’t need in hopes of obtaining new customers, and the good contractors who offer the best solutions at decent prices and perform good quality work. A good contractor will perform a thorough evaluation of the inside and outside of your home in order to find the source of your basement moisture problems. If a contractor is only looking at one area as opposed to the bigger picture you should take it as a red flag. Do not allow high-pressure sales pitches to sway your decision and make sure to ask around for trusted referrals. The basic cost to waterproof a basement averages around $7-$7.50 per square foot in 2014. The estimate is calculated from average material costs, labor, productivity rates and national average hourly labor wages. Make sure to discuss the total cost of your waterproofing services with your contractor and exactly what is and is not covered by the estimate and the total cost. It’s important to communicate openly and honestly so that there are no unpleasant surprises later on when it’s too late. If you are interested in learning more about basement waterproofing services and the costs associated with the systems and repairs make sure to connect with the experts at Triad Basement Waterproofing. The company has more than 27 years of experience with commercial and residential structures and they have developed foolproof methods and state-of-the-art solutions for all kinds of basement issues. Call Triad Basement Waterproofing at (888) 279 – 8819 where you can connect with our team and discuss your options for basement waterproofing and the wide range of services offered by the company. We look forward to hearing from you and assisting you with all of your basement needs! Do-it-yourself projects are all the rage these days thanks to the DIY Network, Pinterest and other similar influences. Tackling a DIY project can be fun, exciting, frustrating and in some cases it may cost you more to accomplish than it would to hire a professional company. The point of DIY is to save money, but if it isn’t done right the first time around it can definitely be a bigger financial burden. Hearing the words “wet” and “basement” in one sentence together strikes fear in the hearts of all homeowners who are lucky enough to have a basement. The basement is a wonderful space located beneath the home, sometimes even built underground. If taken care of, this extra room can be used for anything and everything. Have you always dreamed of running your own yoga studio? Why not set it up in your basement? Fantasizing about a home movie theater? The basement is the best place for this addition. While the basement is a wonderful extra room to take advantage of it is very susceptible to moisture, leaks and flooding. This can be a very bad thing for a home movie theater. 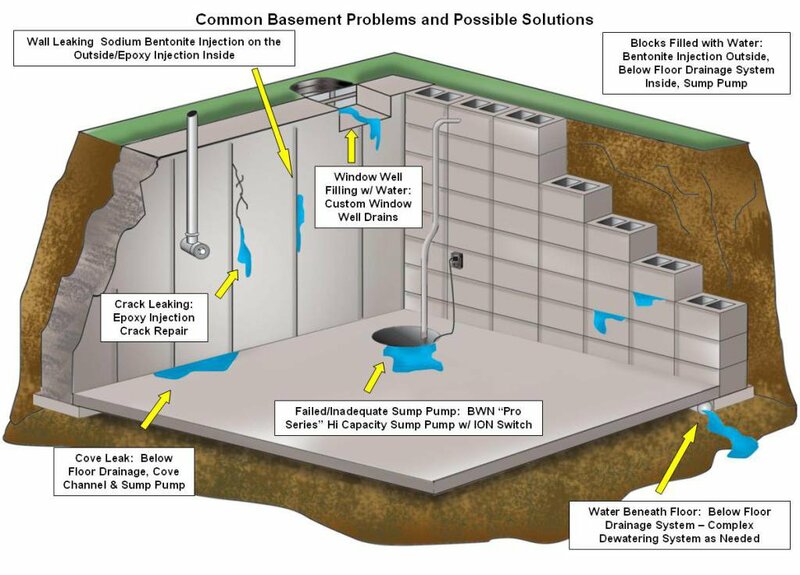 It’s important to understand the risks associated with basement leaks and flooding, to learn the warning signs and to educate yourself on how to repair these issues. 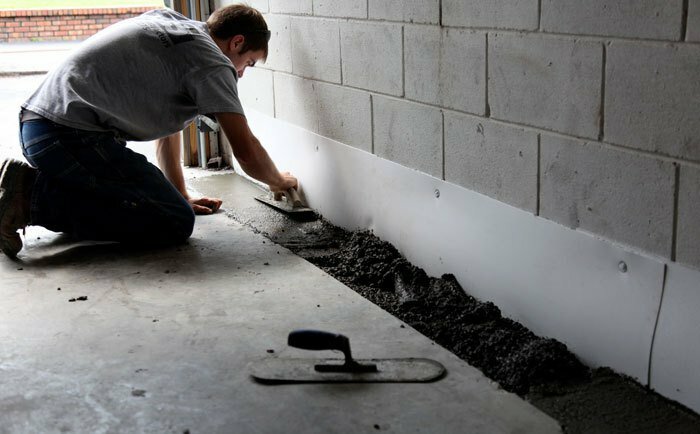 While there are certain problems that will require professional help, such as foundation and structural repairs, there are many DIY basement waterproofing methods that every homeowner can learn and employ in their basements. These are just a couple of warning signs to look out for before you begin tackling DIY basement waterproofing. It’s a great idea to install preventive measures ahead of time so you don’t have to deal with moisture issues at all. Chisel the crack clean – use a chisel and hammer to get rid of any of the large pieces in the crack. This process also helps to make the inside of the crack bigger than it is at the surface, which in turn helps filler material bond stronger. Brush, vacuum and clean – clean up the dust debris that was accumulated during the chiseling process. Spread the concrete filler – slowly fill the crack. Check your work to see whether the filler has settled. If it looks loose you may have to add some more. Allow it to cure – allow the patch to cure overnight and then check again if it requires any additional patching. Seal the concrete – once the crack is patched, it’s a good idea to seal it. Sealants prevent future wear and tear on the concrete such as stains and scuffs. 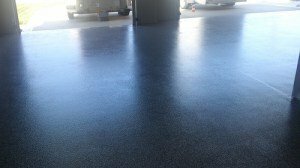 A heavy-duty water based polyurethane sealer is always a good choice and you can easily smooth it on with a broom or a roller depending on how rough or smooth the floor is. Water based sealants generally dry very quickly so you can put on multiple coats of the product in one day. Keep an eye out for future cracks and make sure to take care of them before they get bigger! There are simple DIY tasks you can accomplish to help waterproof your basement and there are also complicated projects that you may need help with. Most homeowners who are looking to tackle waterproofing on their own will initially reach for waterproofing paint, which works for a couple of months but it will eventually begin to peel and it will leave your basement a mess. Not to mention that this paint is not very effective at keeping your basement dry. There are three main methods of basement waterproofing including interior sealants, exterior waterproofing and interior and exterior drainage. Interior sealants are similar to crack repairs. The most common point of entry for water is through cracks and once you seal these from the inside with a good quality filler then you will block the entryway for moisture and leaks. Although these crack repairs and fillers do prevent small leaks and humidity, they are not a permanent solution nor will they prevent leaks if the hydrostatic pressure (water pressure) is very strong against the foundation of your home. You can also paint on waterproof coatings on the inside of your basement. These products adhere to concrete walls and can easily solve minor dampness and condensation issues. Exterior waterproofing prevents water from coming into your basement or home. Although this method can be achieved by an experienced and determined DIY-er, it is highly recommended to seek professional assistance for this method. Exterior waterproofing requires full excavation around the home and to the bottom of the foundation. The walls are sealed with waterproof coatings, which in turn direct water into a drain system such as a French drain. Installing rain gutters or down spouts are also a form of basement waterproofing. Although it may seem simple and it may be hard to believe, rain gutters are very efficient at keeping your home dry. If you continuously clean your gutters and keep them clear of any debris they will direct any water to the downspouts, which in turn should lead away from your home. For homes that experience mild to severe basement leaking, a combination of interior and exterior waterproofing will be best. No two homes are the same and each situation is different, so it is important to evaluate your personal situation and pick the right solution for your problem. Interior and exterior waterproofing is a combination of waterproof sealers and drainage systems such as a sump pump. Installing a sump pump on your own will definitely save you a lot of money. First off you need to select the best sump pump for your needs – do you want a cast iron pump or a plastic one? You need to pick a pump that is perfect for your basement – not too large and not too small. Make sure it fits in the sump pit and that it won’t continually turn on and off. Look for a sump pump with an airtight and soundproof lid. An airtight lid will keep humidity and musty odors out of your basement and a soundproof lid will keep the pump quiet. Installing a sump pump is not easy and it may take a couple of days to complete the installation. You will need to have the proper tools, strength and determination to get the job done. The hardest part of installing sump pumps is breaking through the floor, and if you don’t have a jackhammer then this job may be even tougher than you think. So you followed all the steps, took preventive measures and yet you still ended up with a leaky or wet basement. No worries, the cleanup is a hassle, but it’s not hard. If you live in an area that is prone to heavy rain and storms check your basement often so you can catch a problem before it gets really bad. It’s important to act quickly as soon as you notice water in your basement. Check for any live electricity and shut off power to that part of the house. Try to find out where the water is coming from – through a window, the floor, from a crack in the wall, etc.… Try to catch the water in a bucket before you start your cleanup. Remove any damaged items and hang them to dry. Make sure to set them in a well-ventilated area so they don’t catch mold. Once you’ve cleared space to work in remove the water from the basement. If there is a lot of standing water the best tool to work with will be a pool pump. If that’s not an option use buckets. Once you’ve thrown out the majority of the water soak up the rest with a mop. Once you’ve gotten rid of the water use fans for a couple of days to completely dry out the area. When your basement is dry spray it with disinfectant to keep it from developing any dangerous mold or mildew. Before you decide to tackle a DIY basement project make sure to thoroughly research all of your options. Although there are certain projects that can be very pricy when working with a professional company, n ot all basement waterproofing is expensive. Most companies will also offer free consultations. If you do decide to DIY be prepared with the right tools and equipment. Understand that basement waterproofing is not easy and that it will take a lot of stamina and strength to get the job done right. Also keep in mind that if you don’t achieve optimal results the first time around, it will probably cost you more to fix now than it would have had you hired a professional ahead of time. Triad Basement Waterproofing has been in business for more than 27 years and we are very familiar with all types of basement problems. If you have any questions regarding waterproofing or basement repair please connect with us so we can assist you. We are also happy to consult on your project and give you a free estimate as well as 15% off your first work order. Contact us today so we can get started and protect your basement from any future moisture and flooding issues. We believe that most homeowners who own properties with basements understand that basements need to be maintained and taken care of – especially those who have had to deal with leaky and wet basements. It’s good that people are becoming aware of the issues and risks associated with leaky basements, the problem now is they are not sure what to do about it. Should you hire a professional or do it yourself? Do you need exterior as well as interior waterproofing? What exactly is a sump pump and what does it do? Homeowners know that they need to take preventive measures to secure their basements and they need guidance in finding the best basement waterproofing services. There are different methods of basement waterproofing and other preventive measures to take advantage of. This does not mean that you need to invest in every service available for your home. Every home and basement is unique and there are different solutions to every current or potential problem. Every basement waterproofing company is also different from one another and they adopt different ways of accomplishing their services. Each company will tell you that they are the best and their products work better than the rest. Here is what you can do to find the best basement waterproofing services as well as the top basement waterproofing companies to work with. Although newer companies can be just as efficient as a company that has been in business for more than 50 years, there’s always a sense of peace knowing that the company you are working with has done the job a million times over without any issues. However, you want to be careful about workers who have waterproofed a basement so many times that they do it on autopilot. You don’t want someone who is overly confident and careless. Ask your neighbors and friends about their basement waterproofing experiences. Ask for referrals and recommendations. It’s easier to trust someone who has already dealt with basement waterproofing than trying to find someone on your own. This way, you can also blame your neighbor if the job doesn’t go as well as they had described. In order to double check and make sure this doesn’t happen, ask the company to provide a list of references and actually call the people on that list. There are many review websites you can check to help you find the best basement waterproofing services. Use Google, Yelp, Angie’s List, Consumer Reviews or the Better Business Bureau. Anyone can post anything online nowadays so just be smart about your online research. If a company has a five star rating, but only one review then that means you need to do some extra research to confirm the positive review. There are multiple ways to solve basement issues since there are different causes for individual problems. Look for a full service company that offers a wide variety of services such as basement waterproofing, crack repair, sump pump installation, structural repair, drainage solutions and others. Stay away from those who offer a one-size-fits-all solution. Try contacting individuals who are familiar with the industry such as real estate agents, home inspectors and builders. If a basement waterproofing company has a good reputation these individuals will know about it. Good news travels fast, bad news travels even faster. Warranties are put in place to protect you. Without a warranty a company can quickly smear some waterproof sealant in your basement that really won’t protect much and call it a day. If there is no warranty, when your basement floods a month later you can’t do anything about it except hand over more money to have it fixed. A warranty saves you if something goes wrong with a service you paid for so you don’t have to invest more money on a bad job. Triad offers a transferable lifetime warranty on all services! Just kidding. Although our team has more than 27 years of experience, you should be just as diligent when researching and working with us as you would be if you were researching another company. The best way to feel comfortable with a contractor is to be as certain as possible that the service you are seeking and paying for will be done efficiently and effectively. If you have any questions about the services that Triad offers or if you would like to learn more about our company, our history and our track record please don’t hesitate to contact us. We would be more than happy to answer all of your questions and assuage your fears about leaky basements. Describing a wet basement as unpleasant is an understatement. A wet, leaky and musty or even a flooded basement is basically one of the worst nightmares to deal with for a homeowner – especially during cold winter months. Not only is it annoying to step into a leaky basement, but it can be hazardous to your health. The good news is that a smart homeowner who knows the risks associated with a flooded or wet basement, will take the proper steps to ensure the basement stays dry and warm year round. All houses are not created equal, therefore as a homeowner you are responsible for assessing your home and the surrounding area so you can figure out whether your basement is in danger of flooding. Honestly, all basements are susceptible to flooding and this isn’t because a basement was poorly built. Simply put, when water accumulates outside of the home’s foundation it keeps putting pressure on the concrete – this is called hydrostatic pressure. One day, after all the pushing, the concrete will give up and crack, which is when water happily rushes in to flood your basement and ruin your furniture. The key to keeping your basement dry is good waterproofing and proper drainage. The whole system consists of many parts that work together including gutters, downspouts, the slope of the ground around the foundation, sump pumps and more. It’s important to do your homework when investing in waterproofing so you can make sure that you are investing in the right solution for your home. Let’s review some simple basement waterproofing do’s and don’ts . There are three main methods of basement waterproofing and these are interior sealants, exterior waterproofing and drainage. Since each situation, home and basement is different there are different solutions for different issues. A coat or two of a waterproof sealant may be enough for some homes, while others may need to install a French drain, a sump pump and waterproof sealing. The easiest fixes are always temporary. If you visit a home improvement store you will find many options for waterproof methods and sealants boasting to be the best on the market. You will be bombarded with advertising trying to convince you that so and so product is the best and will fix every leaky basement. This is simply not true. We really can’t stress enough that not every wet basement is the same. If you find a small leak and you want to cover it up with a temporary sealant while you concoct a serious plan of action, that’s fine as long as you understand that this is only temporary and the leak will come back. The best way to fix a leaky basement is to find the source of the water and cut it off. Is the water seeping in through the ground? It is coming in through a window? Is it the foundation of the home? This is the most important step of waterproofing, because unless you cut off the source of the leak and fix it, it will keep coming back. The worse thing you can do for your home, your basement and the overall foundation and structure of your home is to ignore a leak. It may seem small and insignificant, but that small crack or leak will get bigger and then you will have an even more serious problem to deal with. Being cheap won’t get you far, it’s better to invest a little bit of money and take care of a problem before it gets worse and you end up having to pay a lot more for damage control. Did you even know that basement waterproofing can save you money in the long run? It can reduce energy costs, save you money on your homeowner’s insurance as well as increase the overall value of your home. Who would have thought that clogged gutters could ultimately lead to a flooded basement? Imagine a backed up rain gutter suddenly letting loose and dumping all that water against the foundation of your home. Keep your gutters clean and free from debris and leaves so that the collected water can easily make its way to the downspouts and away from your home. Speaking of downspouts, the whole point of having them is to make sure they keep water away from your home. If your downspout is just shooting water against the foundation of your home it’s more likely to cause a problem than fix it. When in doubt, work with a professional company that specializes in all kinds of basement services. Our staff of experts will evaluate your basement and help you figure out what your basement needs to stay dry year round. Maybe you don’t need any waterproofing at all, you’ll never know until you ask. Triad has been around for more than 27 years and our team prides itself on a job well done every time. Give us a call if you have any questions about basement waterproofing , concrete repair or other basement related questions. We look forward to working with you! When you buy a new home you are paying for all the good as well as all of the bad that comes with it. It’s very important to thoroughly inspect a property with a professional multiple times over before you sign any contracts so you can make sure that there aren’t any hidden problems that will creep up down the road. However, if you find a home that you absolutely love and can’t part with and it has structural or basement issues then you need to educate yourself on what steps you need to take to protect your new home and your belongings. Before you buy a home with a wet basement make sure to ask the seller of the home about any underlying issues that may be causing leaks and moisture seepage. The seller should fully disclose all information about the home and you should also hire a qualified home inspector to give you a full report about the home. Does Your New Home to-be Have a Wet Basement? We’ve discussed how to prevent a wet basement and how to fix a basement after it has been flooded, but we have yet to touch on inheriting a basement that has issues with leaking or flooding. The most important thing to remember is that if there are dampness issues with your new basement, you really can’t afford to let them linger. There are many dangers of wet basements such as deteriorating the overall structure and foundation of your home, contributing to hazardous mold growth, damaging your furniture and personal belongings and other unpleasant issues. These issues can ultimately affect air quality and your health. Regardless of what you will be using the basement for whether it’s going to be storage space, a guest room or entertainment center it is still a room in your home and as a responsible homeowner you need to take care of it. So what should you do when buying a home with a wet basement? Let’s find out. In order to figure out why your new basement is leaky or damp, you need to find the source of the moisture. There are many ways that water can find its way into your home. Through windows, wall cracks, through the floor or in the seams between the wall and the floor are most common entry points. Water can’t force its way into your home, so it takes the path of least resistance and looks for a weak spot in your foundation. The underlying cause of a leaky basement is hydrostatic pressure. Water builds up in the soil outside your basement walls and eventually when the concrete can’t hold its own anymore it begins to crack, which allows water to enter into your basement. You may think that a wet basement isn’t a big deal. Most people who have never had a home with a basement before assume that it’s leaky and cold down there anyway. Before you commit to buying a home with a wet basement you need to understand how a wet basement will affect your home and the health of you and your family. Humid and damp spaces are breeding grounds for dangerous mold growth. Not to mention that if there is a leak and it’s not taken care of as soon as possible, it will damage the foundation of the home, which in turn can lead to serious structural issues. If you are dead set on purchasing a home with a wet basement make sure to invest in basement waterproofing. Before you close escrow you could also negotiate with the seller of the property to lower the purchase price of the home or get a credit to fix the leaky basement. It’s better to be safe than sorry and take all precautionary measures to ensure your basement and your home stay dry and warm. There are different methods of basement waterproofing that will help protect your home from leaks and floods. Each home and each basement is different so one solution may work for you while another won’t. This is also why it is important to consult with a professional waterproofing company. While many people decide to try the do-it-yourself option, it’s always safer to hire a professional, especially if you have never dealt with a wet basement before. Triad Basement Waterproofing has more than 27 years of experience and the professional staff guarantees a personalized solution for each basement as well as a job well done every single time. If you are looking for a dedicated and experienced company to help you fix and secure the wet basement of your new home, contact Triad today. The staff will be more than happy to answer all of your questions and evaluate your basement. Is Interior Waterproofing Different from Exterior Waterproofing? As a homeowner, the state of your home is important to you. Not only because it’s a big financial investment, but also because it is your home. Remember how excited you were the day you signed on the dotted line and received your keys? Why wouldn’t you put in the time and effort to make sure your home is in nearly perfect condition? If you live in an area prone to heavy rainfall, snowstorms and heavy snow melts, then you are aware of the damage this kind of weather can bring to your home and your basement. Being the responsible homeowner that you are, you have decided to invest in basement waterproofing for your home. But there are so many options to choose from and there are various methods of basement waterproofing to think about. You also have to think about hiring a professional to do the job for you. And honestly, is interior waterproofing different from exterior waterproofing? Well, let’s find out shall we? Exterior waterproofing is the first defense against water and consists of gutters and downspouts that collect water and lead it away from your home. This is why it is so important to always keep your gutters clean. Another important part of exterior waterproofing includes a waterproof membrane, which is installed around the foundation of your home to seal out moisture so that the concrete doesn’t absorb it, crack and allow leaks. Next is an exterior drainage system, like a French drain. 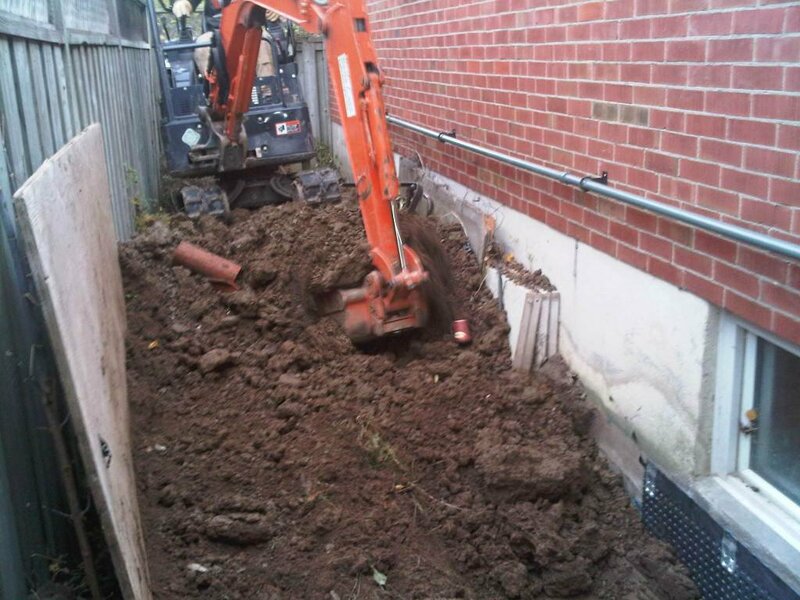 This system can require some work, because it requires excavation along the foundation of the home. Drain tiles are fitted into the trench around the home, surrounded by gravel and then the entire system is covered with soil. The drain tiles will carry water away from the foundation before it has a chance to enter the basement. Although this method does involve some excavation, it can be well worth it. Exterior waterproofing is also more expensive than interior waterproofing, because it requires more work and more material, but it efficiently stops water from getting close to the foundation of your home. When your foundation stays dry, it doesn’t get weak and damaged and it won’t crack to allow water leaks inside your basement or your home. So in turn, a pricy exterior waterproofing system ends up being reasonable, because it saves you money in the long run. Interior waterproofing makes sure that water that leaks into the basement is re-routed out and away from the home. These interior drainage systems are made up of pipes and drains that catch leaks or are installed under the foundation to collect excess groundwater. This excess water is directed to a sump pit, which is basically a large basin that stores water in your basement. Then comes a sump pump , which is a water pump that sits inside the sump pit and pumps water out of the basement and away from your home. Sump pumps usually begin automatically pumping water when it reaches a certain level in the sump pit. Most sump pumps come with a back-up battery so they can continue working in case of a power outage or during a severe storm. Another method of interior waterproofing is made up of vapor barriers. These are made up of plastic or foil sheets and are installed along the walls of your basement to seal out moisture. Apart from an interior drainage system, interior waterproofing also works to seal any cracks and leaks that are letting water into the basement. These can easily be sealed so that they don’t allow any moisture or humidity to accumulate in your home. Investing in a good interior waterproofing system can greatly reduce the risk of a flood in your basement. These drainage systems are easy to install and generally cost less than exterior waterproofing systems. Interior and exterior waterproofing both have their pros and cons. Interior waterproofing can only be used to remove water that has already accumulated in your basement, so they are not effective at preventing water from coming getting into the basement in the first place. Exterior waterproofing can be expensive, but it keeps water away from your foundation and from getting inside your home or into your basement. Regardless of the method you decide on, what’s important is that you are making the effort to keep your home warm and dry. If you have any questions about waterproofing methods, or if you are interested in interior and exterior waterproofing for your home, contact the experts at Triad Basement Waterproofing for more information. Although our homes are built to be resilient to many things, after some time they tend to wear down. In the same way we show signs of age through wrinkles, our homes show it through imperfections and cracks. With the flaws of imperfect construction, pressure surrounding the home and the weight of the house bearing down on it, the foundation of your home takes it all. When it comes to foundation cracks or repairs, the important thing is to take care of the issue as soon as possible. It’s not a good idea to forget about it and wait until the crack gets bigger and allows water to leak into your basement and flood your home. All concrete has the tendency to crack and there is no way to produce crack-free concrete. Concrete expands and shrinks with changes in temperature and moisture and this can cause cracking early on. 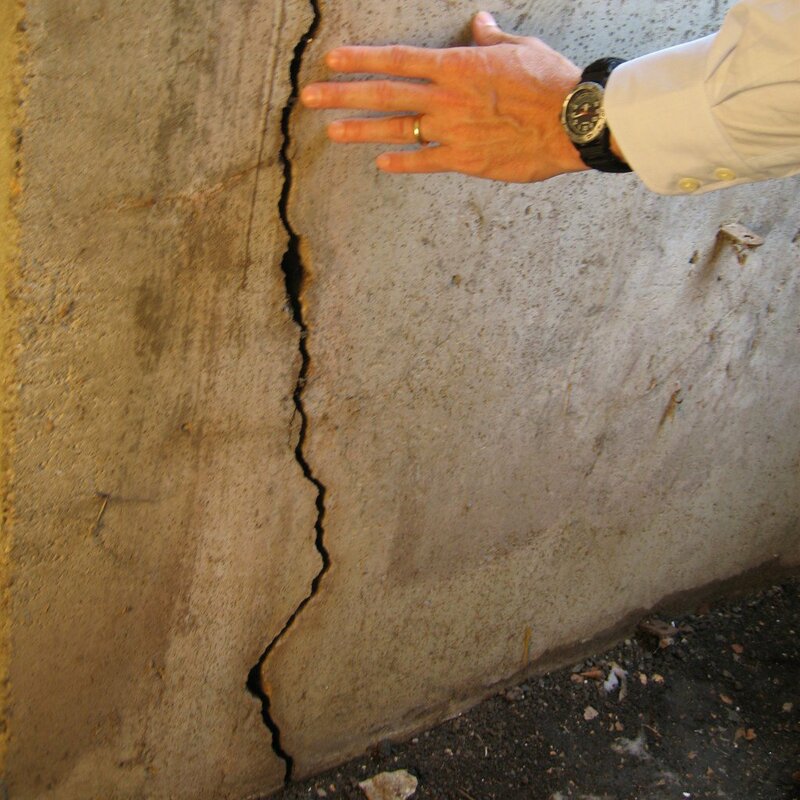 Often concrete foundation cracks are not detected until long after they’ve formed. Regardless of how long the crack has been there, it tends to concern homeowners and they worry about the imperfection. Cracks in concrete foundation most often appear at weak points like corners, basement window frames, walls and pipe areas. It’s important to keep track of these cracks and notice if they are getting bigger. It’s also important to understand why the crack showed up in the first place. What causes concrete foundation cracks? Read on to find out! Soil shrinks like a sponge when moisture is removed from it and when that happens it pulls away from the foundation of your home creating a gap. This gap allows for the foundation to move. When the foundation of a home is not supported properly it can shift around and cracks will begin to appear. In turn, if there is too much moisture it will cause the soil that is supporting the foundation of your home to expand. When an earthquake occurs it causes the ground to shake, which in turn shakes your home around. Thankfully not too many earthquakes occur on this side of the U.S., however even the tiniest of quivers can be an issue. Remember, if the foundation isn’t supported or stable, it can move around, weaken and crack. A small earthquake may not cause new cracks, but it can intensify ones that are already present. Whether you experience a hurricane, a nor’easter or just a typical rainstorm these storms produce a lot of water, which can damage the foundation of your home. Too much water will force the soil around the foundation of your home to expand, which will push up against the home and cause concrete foundation cracks. Storms can also cause various other structural problems if you don’t take preventive measures to secure your home. One of the most popular explanations behind concrete foundation cracks is the freeze and thaw cycle during the winter. Concrete freezes at around 18 degrees and then it melts at around 35 degrees, which is when the cracking develops. It’s important to make sure your pipes are secured and aren’t leaking and that you don’t have any plumbing leaks in your home. If you’re home isn’t equipped with basement waterproofing or a sump pump, the excess water will add to the soil causing it to expand and push against your foundation. 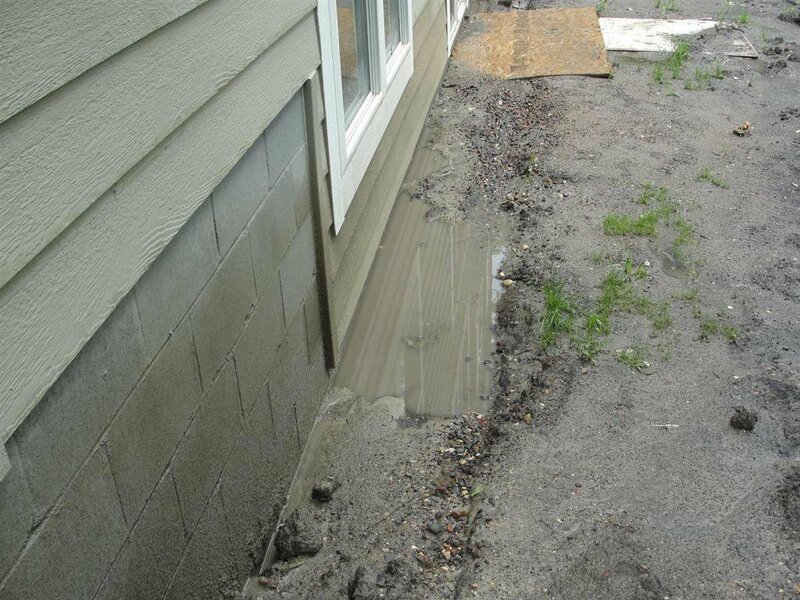 Regardless of whether the flooding comes from a storm, a leak, inadequate drainage or something else, too much water will be a problem for your concrete foundation. When hydrostatic pressure becomes too much for the foundation of your home you will notice more leaks, more cracks and more problems. Concrete can also crack under extreme sun and heat because it causes the concrete to expand. During the day and under the sun the concrete will expand, and then overnight the concrete will shrink and retreat back to its original unbaked position. The moral of the story is that it is important to keep your foundation stable, dry and supported. When your foundation has wiggle room due to dry soil or if it’s tightly pushed in by expanding soil, these movements cause it to weaken and in turn create concrete foundation cracks. The good news is that concrete foundation cracks that are a result of too much moisture and flooding can be prevented through various methods of basement waterproofing. It’s also not too difficult to repair concrete foundation cracks with epoxy injections. If you are thinking about preventive measures or you need concrete repair, then contact the team at Triad and they will create a custom solution to your specific situation. Are you suffering from a wet basement? Or are you looking for precautionary measures to help prevent basement flooding in your home? Regardless of the motivation, it’s a good idea to invest in basement waterproofing for your home so you can protect what is yours, prevent any damages as well as save money instead of spending it on fixing a ruined basement or replacing damaged belongings. If you are trying to figure out a way to cure a wet basement, or how to prevent one from happening then you are probably curious about the products and methods behind basement waterproofing. It is possible to dry out a basement and keep it that way with waterproofing, drainage and sealants, but you need to make sure you are choosing the right method, materials and contractors for your specific situation. Each basement and situation is different so it is important to know where the moisture could potentially come in from and to create a comprehensive solution that is going to last. There are really only three methods to basement waterproofing – interior, exterior and drainage. Let’s find out more about the top three methods of basement waterproofing . The most common entry point for water is through cracks in the concrete foundation. The good news is that these cracks can be easily sealed from the inside. Special sealants are injected into the opening, penetrating through to the exterior where they seal the path off to potential moisture and leaks. These sealants usually last for a long time and come with long warranties. Although interior sealers are good for preventing leaks and humidity, they won’t work perfectly if there is strong hydrostatic pressure (water pressure) pushing against the foundation. Using waterproof coatings on the inside of your basement is also a good idea. Concrete waterproofing coatings adhere permanently to concrete walls and work well where there is a minor dampness or condensation issue. Sealants and waterproof coatings cannot fix major leaks or basement floods. Exterior waterproofing helps to prevent water from entering your home to begin with so that the moisture doesn’t damage the foundation or the inside of your basement. This method is accomplished by fully excavating around the home to the bottom of the foundation. Once that is done, the walls are sealed with a waterproof coating, which will waterproof the walls and direct water down to a drain system. The drain can then be directed to a sump pump or down a slope that leads away from the foundation. This method will efficiently stop water from entering into your home and basement through the walls or through the foundation. If water did somehow make it into your home through a leak, then a proper drainage system is a great way to keep water under control. The easiest way to utilize drainage inside your basement is to have a sump pump that collects the water from inside and then pumps it out away from your home. Interior drainage systems function by draining underground water from alongside the foundation of your home and then pump it away from the basement. These drainage systems should be prepared to work in case of a power outage, an overwhelming rainfall or heavy snowstorm and snow melt. 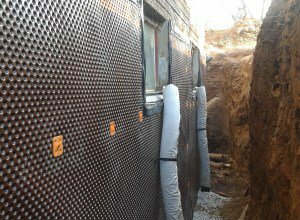 Water drainage is an efficient solution to keeping water out of your home and basement and they can also be airtight and used with vapor barriers to keep the area free from dangerous mold and mildew. Nobody wants to come home to a flooded or leaky basement, so it is important to take preventive measures ahead of time and to be prepared in case a leak does occur. There is no one best way to protect your home from leaks and moisture, because each situation is different. For some homes a coat or two of a waterproof sealant may be enough, while others may need a drainage system as well as a waterproof sealant. When you work with Triad Basement Waterproofing, we will thoroughly analyze your basement, your foundation and your home and compose a unique solution to your issues. We not only waterproof your home, but we also make sure to relieve the water pressure from outside your home. Apart from waterproofing your basement there are also other things you can do to help keep your home warm and dry. Check out some of these tips to prevent a flooded basement. We offer our professional services throughout Maryland, Pennsylvania, Virginia and Washington, DC. If you need basement help or you are thinking about basement waterproofing then contact our experts at Triad today! Winter is upon us and that means that it is very important to protect our basements from any flooding this year. Heavy snow, heavy rain and in turn heavy snowmelts are extremely threatening to unprotected basements. Many people believe that the rainy season is the worst time of year for a basement. While heavy rain does pose a high threat to unprotected basements, winter and snow can be worse. When the temperature of the ground is above freezing the accumulated snow instantly melts and turns into water, which has the same effect as rain. If the temperature of the ground is below freezing, snow will accumulate and as soon as the temperature rises it can turn into a heavy stream of water pounding against the foundation of your home. When water accumulates around your home, the water can seep through any porous surfaces, cracks in the foundation, window wells, etc. You know how a quick change in temperature from cold to hot can crack glass? Big temperature changes can do the same thing to your foundation, weakening it over time and allowing water to flow freely into your basement. The last thing you want to do is walk into a flooded basement during the cold winter months! Don’t wait till winter to invest in basement waterproofing, the colder weather makes it tough to work outside, so it is important to take care of the work before the temperatures drop. Here are some tips from the professionals at Triad Basement Waterproofing that will show you how to prevent a flooded basement in the winter. When you’re clearing your driveway after a snowfall, make sure to shovel the snow away from your home. This ensures that when the snow melts it won’t seep inside your home. Big piles of snow are like a mini river waiting to leak into your home. Keeping your gutters clean is something you should be doing throughout the year anyway. Before winter comes around check your gutters for leaves and debris. Make sure that your gutters are safely guiding water away from your home. Use downspouts and direct them away from your home to make sure that water doesn’t pool near the foundation of your home. Keeping your gutters clean ensures that snow doesn’t accumulate so when the weather warms up you don’t witness a massive snow melt and flood. Water expands as it freezes and this can put extreme pressure on the pipes that are containing it. Pipes that freeze often are those that are exposed to severe cold such as swimming pool supply lines, sprinklers, outdoor faucets and other pipes housed in unheated areas like the basement, garage or attic. A small crack in a pipe can leak up to 250 gallons of water a day, which can cause severe flooding, structural damage and mold. To prevent frozen pipes you can check the insulation in your home, wrap the pipes in heat cables or tape and make sure cold air doesn’t leak inside where the pipes are located. It might also be a good idea to let warm water drip from the faucets overnight to keep the pipes from freezing. Double check your sump pump before winter rolls around. Make sure there are no spots in the hose where water can collect, the water should flow away from your home. If water is collected and freezes, it can stop the pump from working or even damage it permanently. 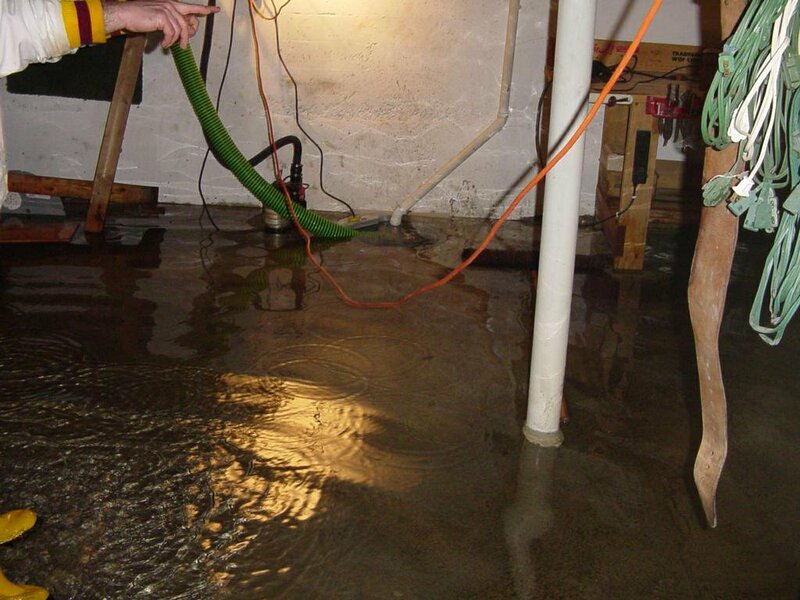 If you do experience any issues with basement flooding, then don’t hesitate to call for help as soon as possible. It’s important to keep your home dry so that mold doesn’t develop and pose higher health risks. It’s important to be prepared ahead of time so that you don’t have to deal with basement issues during the cold winter months, so make sure to take advantage of basement waterproofing and other precautionary measures ahead of time. Coming home to find your basement flooded is never fun, but experiencing flooding during the cold winter months can be brutal. The winter season is supposed to be warm and cozy and there’s nothing like a flooded basement to ruin the whole experience for you and your family. It’s important to know what to look for and how to prevent a flooded basement in the winter. Triad has more than 27 years of experience dealing with basement water problems and the experts here can help insure that your home stays dry at any given time of the year. Check out our website for a full list of services and contact us if you have any questions ! First impressions count. No matter how often we are told not to judge a book by its cover or to ignore physical details, as humans we are attracted to aesthetically pleasing surfaces and put off by dirty, worn out and damaged surfaces. As a homeowner you are aware of the importance of curb appeal, not only for real estate purposes, but also for the sake of keeping the home in good condition. Repairing broken concrete can cost a lot of money and it can be extremely time consuming. Luckily, if you are dealing with a mildly damaged or worn out driveway, patio or sidewalk you do not have to break up the old concrete and have it re-poured. This is where concrete resurfacing comes in to save the day. What is concrete resurfacing? Concrete resurfacing can give your outdoor and indoor surfaces a new finish without the hassle of a complete replacement. The process is easy and saves you a lot of money that you would waste if you were to pour new concrete over your old surfaces. Concrete resurfacing also offers multiple decorative finishes so you can customize the look of your floors and concrete surfaces. If you were to fix a damaged concrete slab traditionally, you would need to break up the old surface and get rid of all the material. This is tiring and very time consuming. New concrete is then poured in for the new surface. This is a very labor-intensive process and it can be very expensive, especially if it is covering a large area. The difference between the traditional process and concrete resurfacing is that resurfacing uses the existing concrete structure as the base. The concrete resurfacing material goes directly on top of the existing concrete area. How Do You Prep The Area For Concrete Resurfacing? The area that needs to be resurfaced should be clean with no loose concrete or other debris around it. Power washing the surface can be very helpful to remove loose and flaky concrete or any other fragments that are left behind. If you are planning on washing the surface with any soap or chemicals make sure that you thoroughly clean the surface. Soap or chemicals may negatively affect the way your concrete resurfacing material adheres. Extraneous material or dirt can also interfere with how the resurfacing material adheres to the surface. All cracks and blemishes on the surface should be covered with repair material to create a smooth canvas for the resurfacing material. The resurfacing material is then poured over the area and evenly spread to create a smooth and even finish. After the new concrete dries it will leave a smooth and beautiful new floor. Although your new driveway or garage floor will now be smooth, this may make them slippery if wet. What we can do to prevent that is to add non-slip coatings. The surface can also be enhanced with any desired decorative treatments. What Is Concrete Resurfacing Made From? Simply put, concrete resurfacing is a thin cement based overlay that is mixed with special bonding agents. It is poured over existing concrete and adheres to create a beautiful and smooth new surface. As your new surface dries it gets stronger and more durable. You definitely want to wait at least 24 hours before driving on it. What Are The Benefits Of Concrete Resurfacing? Apart from saving you money and revamping your old and worn out driveway or patio, there are many other benefits of concrete resurfacing. We went into detail about it in this blog post about the benefits of concrete resurfacing. In short, concrete resurfacing is easier than breaking apart old concrete and pouring it all over again, it saves time and money, it is resilient to future wear and tear, it allows for custom finishes and it gives you smooth and beautiful new surfaces in and around your home. Does My Surface Qualify For Concrete Resurfacing? Concrete resurfacing works best on areas with minor damage. If your floors have large holes or extreme damage to them you may want to look into repairing that first. Concrete resurfacing can’t fix structural problems. If you pour concrete resurfacing over major cracks, eventually they will show up through your new surface and you will have to deal with them all over again. Triad has been in business for more than 27 years and we are well versed in all things basement and cement. If you want to revamp the look of your driveway or patio, contact us for an estimate or for more information about concrete resurfacing. We will happily answer all your questions about any of our services and strategize a plan to keep your home warm, dry and beautiful through any season!